Bu çalışmada ülkemizde Antalya körfezinde kafeslerde yetiştiriciliği yapılan orkinos balıkları (Thunnus thynnus)’nın beslenmesinde dondurulmuş yem balıklarının kullanımının meydana getirdiği histolojik değişimler araştırılmıştır. Bu amaçla, doğadan yakalanmış(kontrol) ve ka-feslerde yetiştirilmiş orkinos balıklardan (70-150 kg, n = 25) alınan karaciğer, kalp ve iskelet kası örnekleri histolojik metotlarla incelenmiştir. Çalışmanın sonucunda karaciğer dokusunda lipit birikimine bağlı olarak hepatositlerde vakoulasyon, iskelet ve kalp kası hücrelerinde de li-pit birikimi olduğu saptanmıştır. Böylece, kafeslerde yetiştiriciliği esnasında yağ ve protein içeriği yüksek yaş yemlerle beslenen orkinos balıklarının sağlığının olumsuz yönde etkilendiği belirlenmiştir. Bluefin tuna (Thunnus thynnus) is a highly migratory species that is targeted for its high commercial value in most of the oceans world-wide, particularly in international waters. Raw tuna, especially the meat from the belly of the fish, is the main ingredient of the Japanese deli-cacies as sushi and sashimi. The best-quality su-shi and sashimi is achieved from fish with high levels of fat accumulated in musculature. Large bluefin tuna (BFT) are fattened in a cage for a relatively short period by feeding with high-fat content food after their capture in the wild. The aim to increase tissue fat content, not to increase fish biomass (Yıldırım, 2004; Yerlikaya et al., 2009). BFT are presently fattened in cages in the Mediterranean Sea for 8 months (from July to February-March), and achieving higher growth rates than fish in the wild, because of higher wa-ter temperature and ad libitium food supply com-posed (mainly of high lipid content fish and cephalopods (Chase, 2002). Mediterranean coun-tries involved in tuna farming include Spain, Ita-ly, Greece, France, Malta, Cyprus, Croatia, Tuni-sia, and Libya. In Turkish coastal waters, BFT aquaculture started in 2002. At present, 6 BFT farms are located in Antalya and Izmir. The main aim of BFT fattening in cages is to improve flesh quality and thereby obtain high-value fish prod-ucts for the Japanese markets (Perçin and Kon-yalıoğlu, 2008; Yerlikaya et al., 2009). Despite the expansion of tuna facilities in the Mediterranean regions, only a limited number of studies have examined the health status of cage-reared tuna (Perçin and Konyalıoğlu, 2008; Yer-likaya et al., 2009). Therefore, in the the present study were investigated changes in the tissues of BFT fattened in cages for determining the health status associated with diet. The BFT were caught by purse seine in the fishing area between Cyprus and Antalya and transferred to cages (1000 ind./cage) in the Gulf of Antalya in Turkey (Figure 1). Approximate density of fish in cages was 1000 individuals per cage. Fish were fattened in cages (diameter, 50 m, depth, 30m) in water depths over 40 m from July to November 2007 and were fed a diet con-sisting of defrosted small pelagic fish (sardine herring, ringa, and mackerel) provided twice dai-ly, with squid 6 days per week. Temperature of the water during fattening the tuna in cages was ranged 23.5-29.6 oC. Tissue samples of liver, skeletal muscle and heart were taken from wild BFT in may and farmed BFT at harvesting time in october (70 to 150 kg, n = 25) for histopathological examina-tion. Samples were fixed in 10 % buffered forma-lin, dehydrated in a graded ethanol and embedded in paraffin. Sectioned tissues (5 μm) were stained with hematoxylin–eosin for general observations. In addition, the sample tissues were fixed in liq-uid nitrogen for 5 min. frozen sections of 5-10 μm were cut in cryostat microtome and stained with Oil-Red O to evaluate lipid content (Ban-croft and Stevens, 1977; Roberts, 1978; Caballe-ro et al. 1999). All the stained sections were ex-amined and photographed under a light micro-scope with digital camera. The quality of food is considered an important factor affecting the health status and quality of farmed tuna (Maita, 2007). Different environ-mental conditions and feeding protocols could also cause variations in fat levels in tuna (Gimenez-Casalduero and Sanchez-Jeres, 2006; Nakamura et al., 2007). Freshness of the baith-fish used for tuna feeding in cages determines the farming success; feeding low-quality fish can cause health problems, increase potential for par-asite invasions and loss of growth rate within the farmed population, and eventual mortality (Dos Santos et al., 1993; Mladineo et al.,2006). In this study was determined vacuolation of the hepatocytes depending on lipid accumulation in the liver parenchyma in the farmed bluefin tu-na fed with defrosted small pelagic fish and squid. Hepatocyte nuclei were located at the pe-riphery of cells (Figure 2). Lipid deposits were also found in the cardiac and skeletal muscle cells. 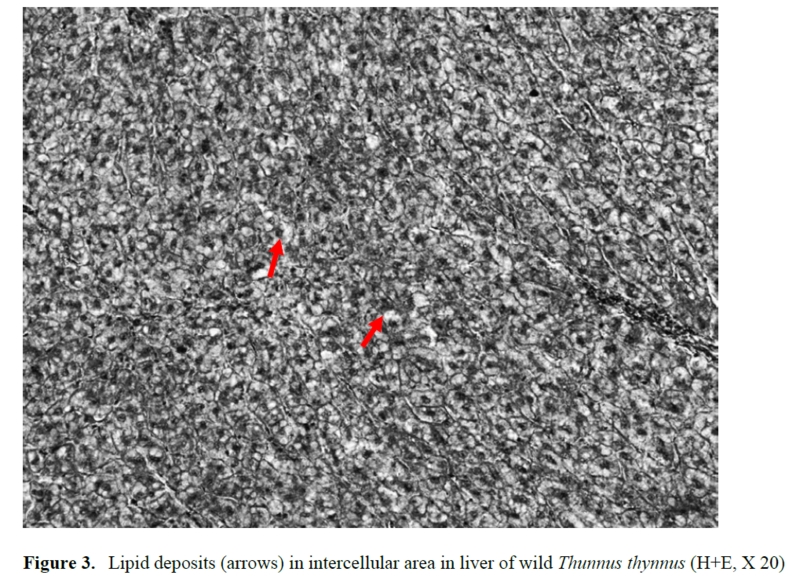 However, lipid deposits were determined in a small area of intercellular area in the liver of wild Thunnus thynnus in this study (Figure 3). Roberts and Agius (2008) reported that hepatic necrosis and lipidosis observed in BFT fed with African pilchards (Sardinops sagax) at the high water temperature (25.5°C) in farmed northern in eastern Adriatic. The most serious cases, result- ing Ferrante et al. (2008) observed higher the li-pid content in cage-reared BFT than wild. Yer-likaya et al. (2009) investigated changes in the proximate composition of BFT reared in cages in the Gulf of Antalya, Turkey, during the fattening period. They observed that the fat content of BFT significantly increased from July (3.25%) to Oc-tober (16.55%). Similarly, Perçin and Konyalıoğlu (2008) determined serum biochemical values finding that cholesterol and triglyceride levels were higher in captive BFT compared to wild fish. As a result of in this study were determined negative affects of feeding with wet foods have high content of fat and protein in the health of cage-reared bluefin tuna. We wish to thank the Research Grant Council of Suleyman Demirel University for financial support (Project number: SDUBAP 1295-M-06). Bancroft, J.D., Stevens A., (1977). Theory and Practice of Histological Techniques.Churchill Livingstone, Medical Div. Long-man Group Ltd. Ednburgh, 436 pp. Gimenez-Casalduero, F., Sanchez-Jerez, P., (2006).Fattening rate of bluefin tuna Thun-nus thynnusin two Mediterranean fish farms, Cybium, 30: 51-56. Roberts, R.J., (1978). Fish Pathology.BalliereTindall, London, 318 pp.